If you need to know just where the mug you are drinking from has been, this Country Of Origin Chalkboard For Mugs will calm any fears. 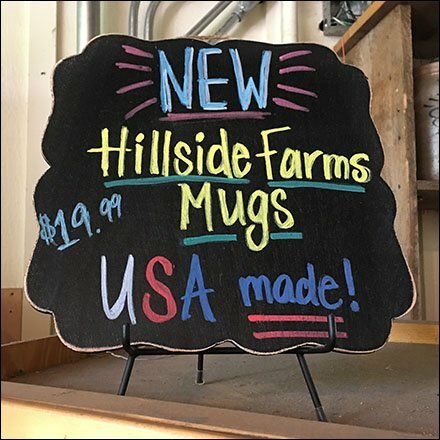 The mugs promote the retailer itself on site, add to profits, build “brand” loyalty, and advertise Hillside Farms with every drink you take. A colorful chalkboard rendition of USA Made gets the message across. All that’s needed is a small piece of slate, a tripod table stand easel, and color chalk or marker. Go USA! Country Of Origin Chalkboard For Mugs seen at the Farm Store of The Lands at Hillside Farms, a non-profit, educational farmstead teaching sustainable life choices, Shavertown PA.